Sonus Faber Olympica 1 Speakers with Matching Stands. Available with Online Finance and Free Delivery. Sonus faber wanted to create a family of speakers rich in content but also evocative of those visual and tactile emotions that have always characterized its production. Thus, wood, leather timeless craftsmanship values of careful and passionate production, able to make anyone understand the sincere love for their work and Music. 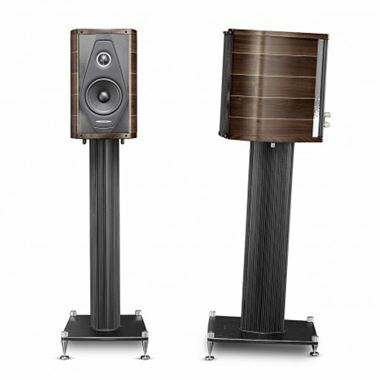 The Sonus faber Olympica project is made up of a new family of passive acoustic speakers that will add to the existing catalogue of the Arcugnano factory, aesthetically characterized by the use of two iconic Sonus faber noble materials, walnut wood and leather. CABINET: Cabinet is characterized by the use of natural walnut wood, top and bottom in solid walnut and with magnificent joints in clear maple wood in the walnut finish. The form is the synthesis of the experience gained with the flagship Aida and the classic lyre form. The important difference lies in the particular asymmetry of the section introduced for the first time by Sonus faber. ALUMINIUM STAND: The bookshelf model benefits from a special anodized aluminum stand (derived from the evolution of the Guarneri model) that allows the speaker to take the correct inclination and, just like the floor models, is equipped with adjustable stainless steel feet to ensure stability and durability. NATURAL LEATHER: The top is covered in natural leather (with feature stitching and hot branded Sonus faber logo) and aluminum ring, the front baffle is covered in natural leather with no visible screws and the back is also covered in leather with sunken serial number tags below which there are the terminals. REFLEX: The last but significant aesthetic note is the unusual location and geometry of the side reflex port vertically designed and embellished with a perforated metal sheet placed in the vicinity of the long outlet. TWEETER: 29 mm dome Tweeter containing DAD technology deriving from the experience of Aida and neodymium magnet. MID-WOOFER: 150 mm Mid-woofer with a cone made of an original mixture of cellulose, kapok and kenaf. SYSTEM: 2 way standmount, paralaminar stealth flow vented loudspeaker. CABINET: Enhanced “Lyre shape” design, progressive thickness triple curvature cabinet walls damped spread resonance spectrum system. Solid walnut vertical clamps. TWEETER: Sonus faber “Arrow Point” DAD (Damped Apex Dome, synthesis of the classic dome and ring transducer) 29XTR2. A Sonus faber designed 29 mm moving coil driver. The ultra dynamic linearity is given by the new Neodymium motor system. MID-WOOFER: Sonus faber MW15XTR. A totally Sonus faber designed 150 mm ultra dynamic linearity midwoofer. CCAW wire is used on a composite former “eddy current free” voice coil. The dynamically linear magnetic field motor incorporates triple Kellog/Goeller rings. A special custom diaphragm is made with a real time air dried non pressed blend of traditional cellulose pulp, kapok, kenaf and other natural fibers, developed according to the most natural sound. To further inhibit any residual cone coloration we are using a transparent viscous surface damping coating. CROSS-OVER: Non-resonant “progressive slope” design, optimized amplitude/phase response for optimal space/time performance. “Paracross topology” on both tweeter hi-pass and midwoofer low pass, cross-over point 2.500 Hz. FREQUENCY RESPONSE: 50 Hz – 30.000 Hz, tuning port included. SUGGESTED AMPLIFIER POWER OUTPUT: 40W – 150W, without clipping. FINISH:Natural walnut multicoated with medium gloss ecologically sensitive lacquer or gloss black.